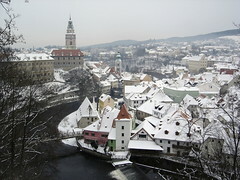 I took this photo in Český Krumlov, Czech Republic quite a few years ago. I always thought it was a good photo and it was even my desktop background for some time, but it never got many views on Flickr - until a couple days ago when someone put it up on their Tumblr. Since then it has been viewed a lot and been favourited by some. I wouldn't go so far as to say it is viral, but it is cool to see how fast things can spread on the web.